People living to 100 will have longer productive working lives, and will contribute economically to society for longer. 75-80 will become the new retirement age. You can see it already with the raising of retirement ages to 67 and above in several countries. I've no doubt that retirement will become a luxury ( it's already been pushed out to 68 by 2028 ) unavailable to the less well off in society. It's all very well pretending that people in their 70s and 80s should be healthy enough ( fat chance ) to work fulltime but the essential problem that the technological revolution is bringing about is one of replacing humans in the workplace with more cost-effective technology. How many mac jobs will there be to do and where will the real jobs be to pay for them? Taxi-driving the staple job of the semi-retired is close to being made redundant as the autonomous vehicle revolution gets going. Shop teller is another job that's vanishing already. It's only a matter of time before software knocks the absolute stuffing out of all those Financial Service sector jobs. I don't believe many intend that retirement should become a luxury, just proportionate to life expectancy. The reason people are living longer is because they are healthier. People will need to be better educated. In college until 25, a fifty year work career, changing employer every six months, career every 10 years and 25 year retirement. New industries to serve tech change will emerge to replace the dying industries. I'm not suggesting utopia, there will be winners and losers, and the poor will always be with us. One of the reasons there are 7.1M job openings in the US at the mo is that those seeking work are not sufficiently well educated to fill the positions. Meanwhile Trump & Co want to limit well educated Africans, Indians Chinese etc. from filling those positions. As Michael Bloomberg in my view rightly says, "every foreign student graduating a US college should have a green card stapled to their degree". There were a record 7.1 million U.S. job openings in August, the most since the Department of Labor began tracking the data in 2000. Go deeper. Check the map here. Everyone is competing against this. It's nearly 15 years since Tom Friedman wrote The World is Flat. OOps,if the donald is the source should I believe it? Anyway, I haven't looked, but how many of those jobs are gig jobs? Overall, AI will replace jobs, progressively, already has in the motor industry, for example. Yes better education will be needed, but, ask yourself, where is the education system "better" I'd wager it is better in Japan, China and India, with pockets in Scandinavia, Germany and a few others. Just today I see that grinds are replacing teaching in classes. There is a strange equation in progress - better health = longer life; but AI = less work. Of course the current politicians are not planning for the consequences, in most countries, except by pushing people towards private sector pension provision. Short term gain for their friends in the finance sector. Good article, and a good book, well worth a read. Extended life expectancy is as much about keeping unhealthy people alive far longer than they used to live in the past than it is about people living bouncy healthy post-retirement lives. Drugs and surgery are prolonging the lives of people already substantially disabled by the ravages of time. The point about the pivot towards Asia shows the probable lack of viability of the traditional Western high standard of living. Not everyone is capable of educating themselves and operating at an elite technical level. There are only so many engineers and scientists necessary to service the future economies of countries. As AI evolves it will reduce the need for humans to do the design and diagnostic work necessary to serviçe economies. Capitalism worked because people with Capital needed working people to process raw material into saleable products and in turn those paid workers bought goods from a variety of Capitalists. Whither now for that system when working people are becoming increasingly superfluous to the production process and where the cash rich corporate world is increasingly in effective control of how social assistance is financed by taxes ( don't tax us much or we'll move all the jobs elsewhere ). In a globalised world there's no need for Capital to finance education for the technically limited masses when they can import a never ending stream of the high quality graduates from what was the traditional third World. This all feeds into lower and lower relative incomes for all stratas of society bar those in charge of setting their own incomes. At the other end of problem is who will buy the goods and services provided by Capitalists if working people can't find employment to generate the income necessary to purchase those goods. A chicken and egg conundrum. In the long term there are likely to be huge income collapses in those countries least able to adapt to the economics of the high tech future. Last edited by Shaadi; 20-10-2018 at 11:28 AM. Yes, our politicians refer to this as an "aging population" and it will need money. With 50% of the population having private health insurance with no tax relief, they will pay for their age. The other 50% will, maybe, be funded by the state, but with the annual budget overrun expanding will the aged have to pay more tax for them? With less work in the future will there be the tax base? Another conundrum. Yes, some countries have already started to think about and try solutions. With less and less capital requirement and the current movement towards the big profits being less taxed, both legitimately and illegally, the money to buy the goods may be reduced abd less tax available. More and more of the wealth is already in the hands of fewer and fewer people. There is little or no evidence that the rich will stump up. That's a very depressing outlook. While it's true that better medical procedures keep people alive longer, to say that extended life expectancy is as much about that as people simply living longer an healthier is in my view way off the mark. In the US the number of people 65+ still working either by choice or circumstance far exceeds the capacity of hospitals etc. to treat acute illness. On the issue of future jobs, it has been estimated that for every job the internet destroyed, it created 2.6. Acute Hospitals are for treating acute conditions. The type of conditions that bedevil people as they get older tend to be chronic conditions such as diabetes, heart disease, lung disease, rheumatism etc that don't necessarily receive much attention from the Acute Hospital system. It's quite normal for an older person with such diseases to have a poorish quality of life despite the fact that they live at home and don't clog up the Acute Hospitals. The Internet's ability to create jobs was unsurprising, it provided a giant shop window for a vast array of goods at a time when there had been a credit explosion. It retains that ability to create jobs as its penetration of emerging markets allows for more trade opportunities. In the West I would argue that we've reached close to a peak in our desires and earning ability to consume even more than we already do. We maxed out as a combination of cheap credit and ultra-cheap mass production allowed us to gorge on mindless consumerism. As the pivot towards Asia and the development of more and more cost-effective automated production and distribution increases there will come a point when the amount of actual productive employment can no longer pay for the totality of a country's expected standard of living. At that point tinkering with extending the working life and hours worked by individuals will be a case of trying to spread productive work too thinly. The Internet and AI are totally different. The Internet was a natural progression from technological developments. It was only ever held up by the luddites in the PTTs, the monopoly suppliers up to the 80s. Even in the USA the three major carriers acted like monopolies and sat alongside one another at the UN meetings in Switzerland where the standards were agreed and the arrangements for billing were sorted. Ironically, Margaret Thatcher's move to privatise the Post Office couple with pressure from academic networking requirements and military needs to secure networks did the rest. The movement to AI is exactly what Shaadi argues, old capitalism failing spurred by Asia driven smarts. The movement towards less work, more leisure, will bring big political problems. In todays IT, Laura Marlowe has an interesting piece on the moves to fascist governance. Big business is behind a lot of it, they only want to make more millions and don't care if the $/€ are produced by robots. Fascists want to downgrade "workers" and upgrade the monied right wing. Here is, IMO, a carefully thought out and argued analysis on digitalisation (not just the internet) and its future affects. Yes, I said acute when I meant chronic, apols. I find your analysis excessively gloomy. Lots of future jobs in the west, will be created to service some of the needs of the east, and other developing areas. Of course it won't be 100% but it doesn't need to be. It's a good article, but I don't think it addresses what you suggest. I don't believe anyone has claimed digitization would not destroy some jobs, and the author neglects to say it can also create jobs. Seemed more to me that he had arrived at a conclusion and then looked for a way justify it. Maybe you didn't grow up dreaming of being an "augmented reality journey builder" or "master of edge computing" — or a "cyber calamity forecaster." Why it matters: This is the sunnier side of the apocalyptic argument that robots are going to eat our jobs. That assessment comes from a report — released first to Axios by Cognizant, an IT firm based in New Jersey — identifying 50 "jobs of the future" to replace the many current occupations that are being vaporized. "Work culture," which grew at a "frothy" rate over the past year, includes training and development specialists, career counselors, and industrial-organizational psychologists. "These specialists are using technology to do a better job, and helping employees do the same," the report says. Cognizant keeps a quarterly jobs tracker that tries to determine whether new jobs will efficiently replace those eliminated. 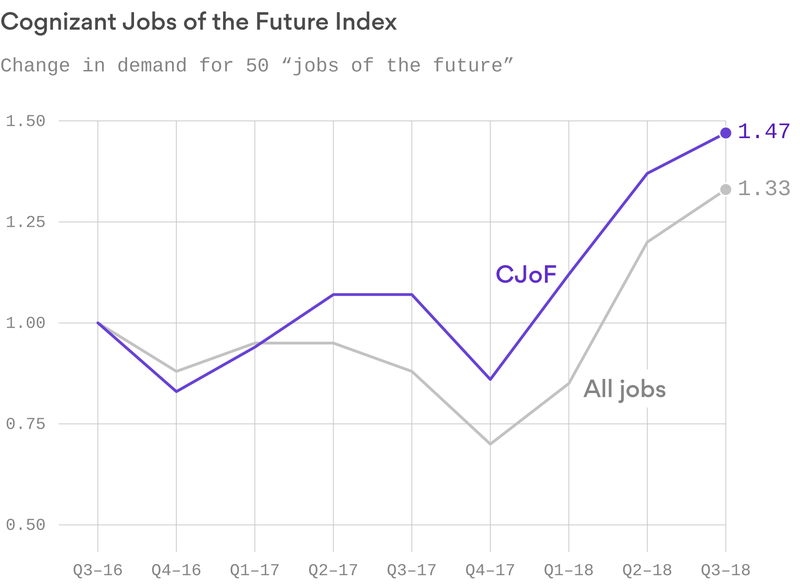 So far, so good: Since early 2017, the index's "jobs of the future" have been growing faster than all jobs. The report says that the only job category to fall over the past year was health care, which includes everyone from biomedical engineers to registered nurses. Reasons include financial pressures in the industry, and uncertainty about U.S. health care policy. Be smart: Surprisingly, "a lot of the jobs of the future are jobs [that are being done] today," said Benjamin Pring, director of the Center for the Future of Work at Cognizant. "That everyone would be a computer scientist is unrealistic." In fact, some traditional job categories will grow as they add a digital component.